NEW YORK, Dec. 21, 2015 /PRNewswire-USNewswire/ -- 2015 has proven to be a milestone year of growth and achievement for the Institute of Culinary Education (ICE). New York City's oldest culinary school became its newest, with the school's move to Brookfield Place on the Hudson River in Manhattan's rapidly growing "downtown." ICE's new home is the largest culinary education facility built in a major American city in more than 10 years. The new 74,000-square-foot space (increasing in size from ICE's prior 45,000-square-foot Flatiron location) was designed with both creativity and community in mind. The school's layout is like "culinary village" with 12 teaching kitchens, six classrooms and various new features that will enrich students' daily educational experiences and support new, diverse course offerings. Special features include a Culinary Technology Lab, indoor hydroponic farm, a Chocolate Lab featuring "bean-to-bar" education and iPad-enabled teaching kitchens. As for ICE'sBrookfield Place neighbors, the complex is also home to headquarters for Time Inc. and Food & Wine Magazine, American Express, Bank of New York and more. Regarding the move and new facility, ICE President Rick Smilow notes, "We think the learning environment we have built stands out among all of the worlds' urban-based culinary schools." He added, "Today there is a well documented shortage of cooks, chefs and restaurant managers in America. With this new school, we are doing our part to help address the sector's staffing needs." ICE also had more than the move to celebrate in 2015. In the spring, the school won two awards granted by the International Association of Culinary Professionals (IACP): the 2015 Award of Excellence for "Culinary School of the Year," and additionally, Chef Instructor Chris Gesualdi was named 2015 "Culinary Educator of the Year" by the organization. Both the move and the awards coincide with school's 40th anniversary and follow record high career student enrollment in 2014. Nearing year end, in 2015, ICE once again reports very strong student achievement metrics to the US Department of Education, including an 89% graduation rate* and 86% employment rate**. To celebrate the school's new location, awards and anniversaries (ICE's 40th and Rick Smilow's 20th year as the school's President), onNovember 16, ICE opened its doors to culinary giants including chefs Daniel Boulud and Marc Murphy, restaurateurs Danny Meyer andDrew Nieporent, alumnus Gail Simmons and more. Commenting on ICE's growth, Chef Boulud says "I can see this school being here for 50 years from now—and being very relevant." About the Institute of Culinary Education The Institute of Culinary Education (ICE) is one of the largest and most diverse culinary schools in the world. 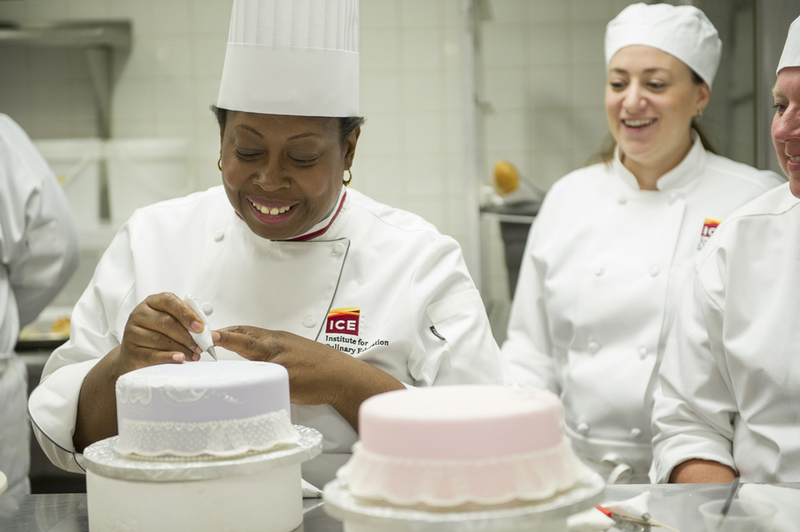 Established in 1975, ICE offers award-winning six to 13-month career training programs in Culinary Arts, Pastry & Baking Arts, Culinary Management and Hospitality Management – with more than 12,000 successful alumni, many of whom are leaders in the industry. ICE also offers continuing education for culinary professionals, hosts more than 500 special events each year, and is home to one of the world's largest recreational cooking, baking and wine programs with more than 26,000 students annually. In 2015, marking the school's 40thanniversary, ICE moved to a new, transformative 74,000-square-foot facility at Brookfield Place in downtown Manhattan, designed for inspiration, creativity and community. Visit us at ice.edu or join us on Twitter and Facebook @iceculinary to find your culinary voice™.